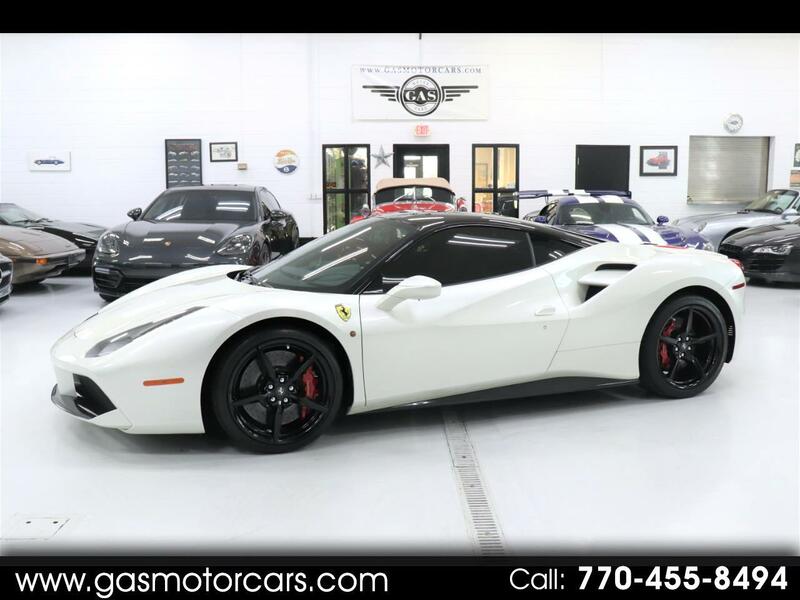 JUST ARRIVED, 2016 FERRARI 488GTB, 8,873 MILES, BIANCO FUJI WHITE EXTERIOR WITH NERO ROOF, FERRARI ROSSO INTERIOR WITH BIANCO WHITE STITCHING, $397,000 MSRP!!! SOME OF THE OPTIONS INCLUDE: RED BRAKE CALIPERS, CARBON FIBER FRONT AIR DAM, CARBON FIBER REAR DIFFUSER, CARBON SIDE DUCTS, CARBON FIBER DRIVER ZONE LED STEERING WHEEL, CARBON DOOR SILLS, CARBON DASH INSERTS, TITANIUM EXHAUST TIPS, SCUDERIA SHIELDS, PARKING CAMERA SYSTEM, GOLDRAKE CARBON RACING SEATS WITH BLACK CAVALLINO'S, PREMIUM JBL HIFI SOUND SYSTEM, AND MUCH MORE! THE 488GTB IS POWERED BY A 3.9 TWIN TURBO ENGINE PRODUCING A STAGGERING 661HP AND 561LBTQ!! 0-60 IN JUST UNDER 3.0 SECONDS AND A STANDING 1/4 MILE TIME OF 10.4 SECONDS!! TRULY AMZING CAR INSIDE OUT AND NEAR FLAWLESS CONDITION!! GAS MOTORCARS INC IS A FAMILY OWNED AND OPERATED DEALERSHIP LOCATED IN MARIETTA, GA. WE ONLY SELL VEHICLES OF THE HIGHEST QUALITY. WE SHOW VEHICLES BY APPOINTMENT ONLY. WE CAN PROVIDE EXOTIC CAR FINANCING FOR QUALIFIED CUSTOMERS. PLEASE CALL US DIRECT AT 770-455-8494 FOR MORE INFORMATION ON THIS VEHICLE. Message: Thought you might be interested in this 2016 Ferrari 488.